I hate mosquitos and hate getting mosquito bites. I also worry about the chemicals that most bug sprays have in them. 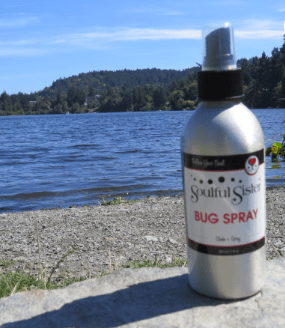 So when I came across Soulful Sister Bug Spray I knew that we had to put it to the test. Keep the bugs away naturally with Bug Spray made from pure essential oils. A lot of bug repellents on the market contain chemicals that aren’t great for humans or the environment. This spray smells as good as it works because we use the essential oils of Eucalyptus, Clove, Lemongrass, Lavender & Cedarwood. Please do not use directly on skin for children under 5. (It is unknown what children are allergic/sensitive to until they get a bit older). For children, try spraying on clothing instead of directly on skin. These are precautions for skin sensitivities. With our recent 6 day/5 night trip to the cabin, we had the perfect environment to put our bottle of Soulful Sisters Bug Spray to the test and let me just say right up front that it works and it works really well. Not only do you smell amazing when wearing Soulful Sister Bug Spray, but it keeps the pesky mosquitos away. My Little One ended up with a mosquito bite on her foot when she was wearing her sandals and we forgot to spray her feet. In total, she came home with three mosquito bites. I came home with two mosquito bites. The key to making sure that Soulful Sisters Bug Spray works for you is to mist over your entire body. I also recommend reapplying a couple of times a day. The bites that we did receive were either on areas we forgot to cover with bug spray or occurred sometime after application of the bug spray where it was time to reapply. I would recommend that if you are in an environment like we were, such as a cabin or camping etc., where you are constantly exposed to the bugs, that you apply in the morning, afternoon, and evening to ensure constant coverage. If you go in the water, then I recommend reapplying the bug spray once you are out. I can confidently say that without a doubt, we have found our bug spray of choice with Soulful Sisters Bug Spray. The only thing that I wish is that it was easier to find in a store. I would love to see this and the entire lineup of products in our local natural market, Pomme. I did find Soulful Sisters products for sale in one store on a recent trip to Bowen Island. Rest assured though because you can buy the entire lineup of Soulful Sisters directly from them on their online shop.